Punk Prejudice exists, and the world of punk music and fashion is no exception. Punk Prejudices made life as a wild-child that much harder. But why? Every good, strong phenomenon and its style usually has a large veil of steady rumors, widespread views which are often very negative and shallow or superficial labels. Well, most of those aren’t true and they make an artificial constructed darkness around the wonderful world of eternal fashion and unique music, which strongly inspires our collections presented here. When we talk about punk music and culture, it’s hard to avoid all the hard and dark charges. People are easy on delusions when it comes to punk music and fashion. To set loose those ugly myths, we bring you a list of most popular Punk Prejudice and some of the many counter-arguments. Punk fashion is extremely dark. This punk prejudice is WRONG! It is dark, but not extremely. Actually, colorful details are very common among punk lovers, as you can make sure in this special category. Hair dyed in bright red, green or even pink is also frequent. And not to mention the tartan cloth and other crazy colored combinations. Since punk originates from social dissatisfaction and some dark moods, a little bit of darkness is necessary. But if music was in colors, the vigorous punk chords would be a hard rocking rainbow. 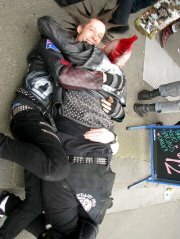 Punk artists and fans are drunks and druggies. That’s a hard one and very, very WRONG one. Drug and alcohol abuse status has nothing to do with the music or fashion style. This punk prejudice linking some addicting vice to a certain style and music is just a superficial labeling. Maybe some of the punk stars did end up their lives thanks to the drugs, but it’s not a general rule. Listening to a certain kind of music and wearing certain clothes is not enough to ruin your life with drugs, so blaming punk for it is simply mindless. Do we count love as a drug? Punk prejudice: punkers are uneducated bums. Well, when it comes to the education, some of the punk musicians are ready to break the regular oppinion that punkers are stupid. 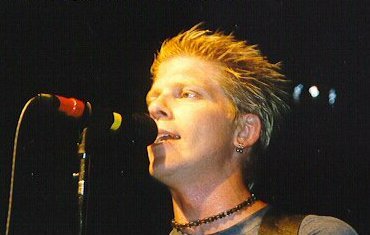 Dexter Holland, the lead singer of The Offspring has and M.S. in molecular biology. Also, Greg Graffin, the lead singer of Bad Religion, actually has a Ph.D. and he was a teacher at the University of California. He is also a straight edge. So, I guess that’s settled then. Punk lovers are aggressive. This punk prejudice is definitely WRONG. Actually, punk lovers usually expel the excess of energy trough the music or jumping around on the shows. Yeah, a mess can happen, sometimes they put up a fight – but when you are at a punk show, you probably won’t see the whole audience fighting. Well, that’s just a part of a big pile of punk prejudices. It all overshadows the punk fashion and when someone wears the awesome punk clothes, he or she often has to confront some offensive looks in public. Many decades after its outbreak, punk still shocks the majority. Well, even though it is sad that it still causes such reactions and prejudices, its provoking abilities are also its biggest power.